Public consultations start today: take action for decent work! Email & tweet the Minister of Labour! The government is reviewing Ontario’s labour laws for the first time in a generation. The Changing Workplaces Review (CWR) is holding public consultations starting today in Toronto, and in 8 other cities across the province through June, July and September. The Workers’ Action Centre will be there, along with many other allies and organizations that are fighting for decent work. Now is the time for the government to hear from workers about what needs to change to bring fairness to our workplaces. Email and tweet Minister Flynn: @OntMinLabour @MPPKevinFlynn. Tell him it’s #time4decentwork and #15andfairness in Ontario! Ask your friends, family, co-workers, and neighbours to do the same. Book a meeting with your local MPP to share your experiences and your concerns, ask them to support the campaign, or ask that they organize a community forum on decent work. Start your own conversation in your community about what decent jobs would look like. Contact us if you need support. Submit your story to the consultations. You can find information on how to do this on our website. Upcoming consultations will be taking place in Ottawa (June 18), Mississauga (June 24), and Guelph (June 25). Today’s Toronto Star article, “Ontario’s ‘eye-popping’ shift to low-wage work”, shares findings from a new report by the Canadian Centre for Policy Alternatives Ontario, which shows that precarious and low-wage jobs are on the rise. The report, titled A Higher Standard: The case for holding low-wage employers in Ontario to a higher standard, tracks the growing reliance on low-wage and precarious work, and stresses the need for the government to raise the minimum wage, to require employers to schedule more predictable work hours, to set a higher standard for paid leave, and to make it easier for low-wage workers to unionize. 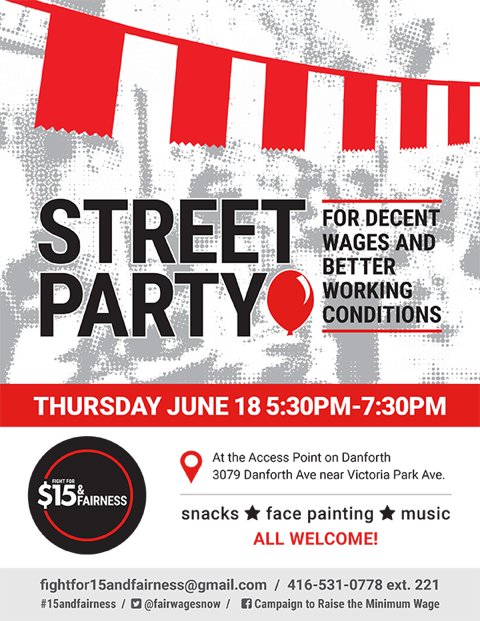 This Thursday June 18, from 5:30pm-7:30pm, the Workers’ Action Centre and Access Alliance are throwing a street party for the Fight for $15 & Fairness! Join us for snacks, music, games, and facepainting – and chatting with the neighbours about decent work! We’ll be at Access Point on Danforth, 3079 Danforth Ave. (at Victoria Park Ave.). Join the facebook event here. Check your inbox, our website, and our facebook page regularly for further updates and to see how you can get involved in the fight for decent work in Ontario.